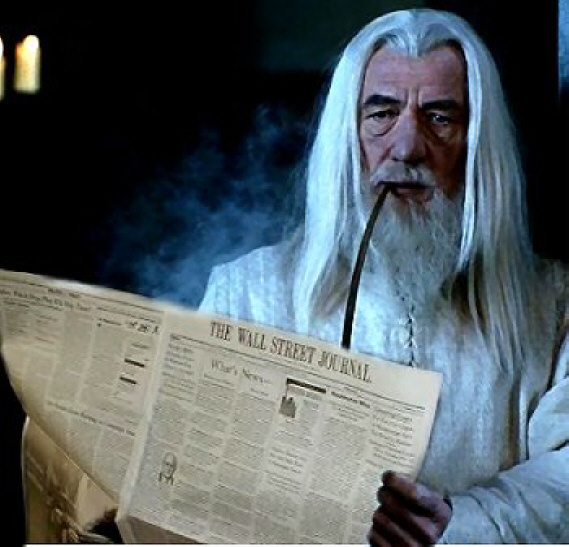 Gandalf: "Wall Street Journal? I don't remember there being a Wall Street in Minas Tirith. Now that I think of it, it is in Mordor! Crooks the whole lot of them! Not satisfied with wanting the world but every body's livelihood! Frodo better hurry up and get rid of that bloody Ring!" Ian: "Looks like more Orc Crap is up today, I mean Oil Prices are up." "Hey, there are no comics in this paper! I want my Gondor Gazette!"